Style # 125022. 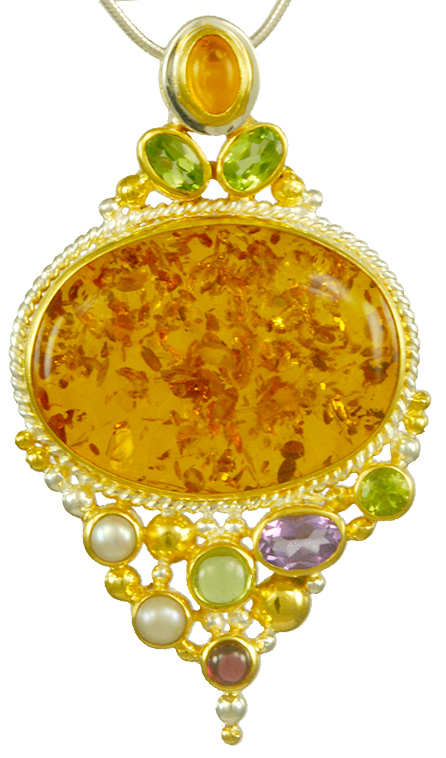 There is only one word to described this Michou Cascade Sunlit Gemstones Collection Pendant….and it’s STUNNING! 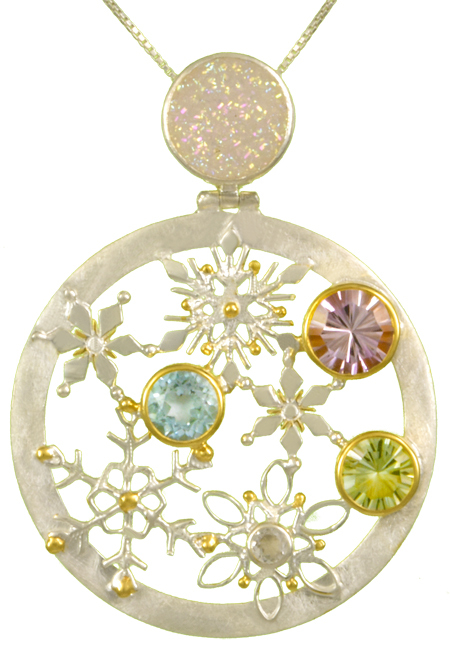 This Statement Pendant is 100% handcrafted in Sterling Silver with 22kt granulation details. Each gemstone featured in a Michou design is hand selected, and the gemstones in this piece compliment one another beautifully. The center of this luxurious pendant is Baltic Amber, which, aside from it’s incredible beauty is thought to help ease pain, anxiety and fatigue. While we can’t testify to it’s health benefits, we certainly feel better and more beautiful when we wear it! You can read more about Baltic Amber from the Gemological Institute of America. This piece is accented with Peridot, Freshwater Pearl, Rhodolite Garnet and Amethyst. A kaleidoscope of color for any season! This pendant measures 2.25″ in length and is 1.25″ wide. The center Baltic Amber is an oval shape and is surrounded by a delicate rope detail in silver. Accent stones are set in a bezel setting with granulation details. Granulation is an ancient technique where small grains of silver are fused to a solid plate of silver. They are attached only at the point of contact. This is a technique that dates back to the Etruscans and has been perfected in traditional Balinese jewelry. Silver wire is cut into small bits and then torched so that the bits become spheres. The spheres are then sorted by size through a sifter. Once the granules are sorted, they are applied by hand to the piece being made. This piece also features Gold Vermeil. 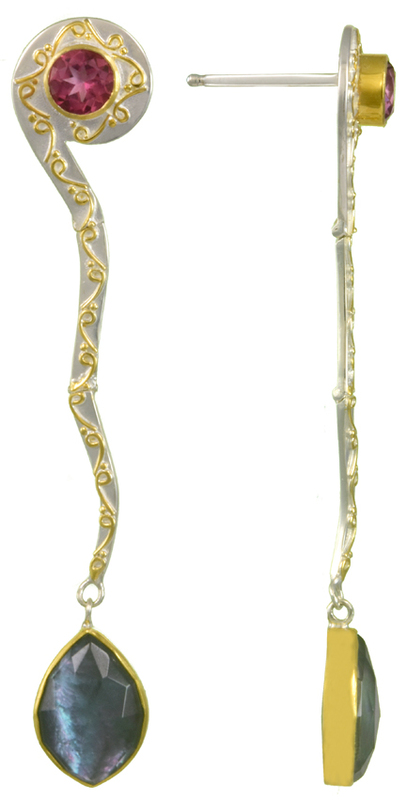 Vermeil is the process by which microns of gold are deposited onto a sterling silver surface by an intricate process. All details that are not to be gold must be hand painted with a masking solution in order to protect the silver from the gold being deposited on it’s surface. Michou steps up their quality by applying a full 3 microns of gold versus the industry minimum of 2 to assure their finish is durable.